Our latest co-branded edition of The Insights Review, produced by the Internal Consulting group (ICG) is out now. ICG is a global network of consultants, with the goal of aiding professionals in their career effectiveness and development. The Insights Review is a collection of abstract reviews of relevant ‘open published’ perspectives and research reports. The abstracts allow you to scan quickly for the most relevant content, and include links to the full articles. Each edition includes an ‘Article of the month’. 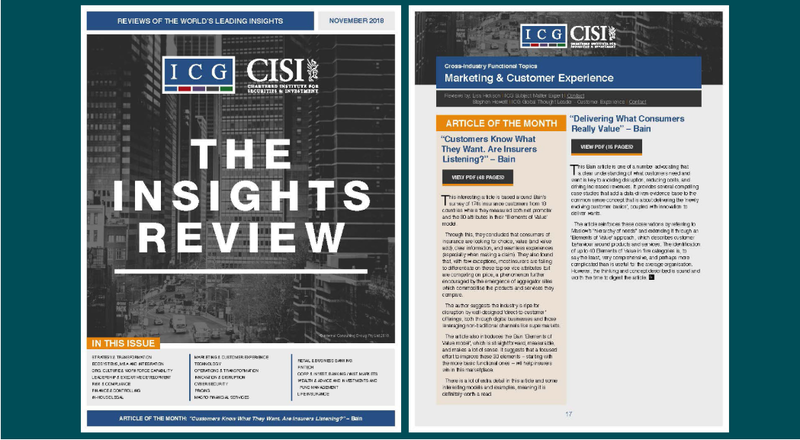 The top article for November 2018 is ‘Customers know what they want. Are insurers listening?’ by Bain. The article is based on a survey of 174,000 insurance customers from 18 countries. The abstract says: “They concluded that consumers of insurance are looking for choice, value (and value add), clear information, and seamless experiences (especially when making a claim). They also found that, with few exceptions, most insurers are failing to differentiate on these top service attributes but are competing on price, a phenomenon further encouraged by the emergence of aggregator sites which commoditise the products and services they compare.